I can't believe we're almost done with the month of May. Time is quickly flying by and for those of us who made the goal to eat healthier earlier in the year, this time of year can be a bit hard. Especially with the warmer weather, there will be tons of barbecues coming up and why wouldn't you want to enjoy all the delicious food people bring to those gatherings. Well, May is National Salad Month and there are tons of salads you can make to help keep you on the right track to eating a bit better. I know for me it's always hard to eat the same thing over and over again, but that's why it's good to look up new recipes and try them out so that you can update that average salad you eat for lunch with a brand new one that will have your taste-buds in aw! Here are a couple salads that I found that taste absolutely delicious thanks to Marzetti Simply Dressed. 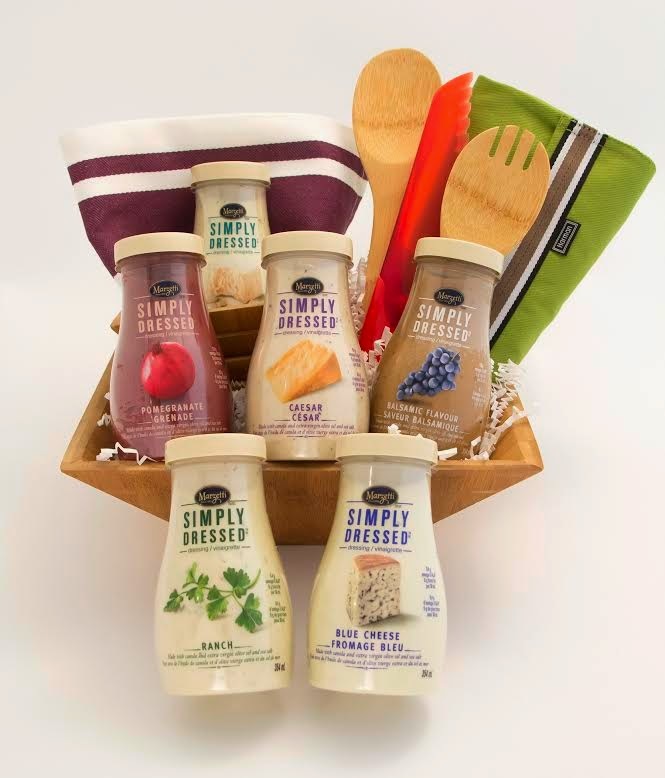 Not only do they have tons of fresh new salad recipes you can try over at their website, but they also have some delicious salad dressings you can try to help give your ordinary salad a new pop. Preheat oven to 350 degrees F. Place nuts on a sheet pan and bake 5 to 7 minutes or until nuts are toasted. Cool and chop. 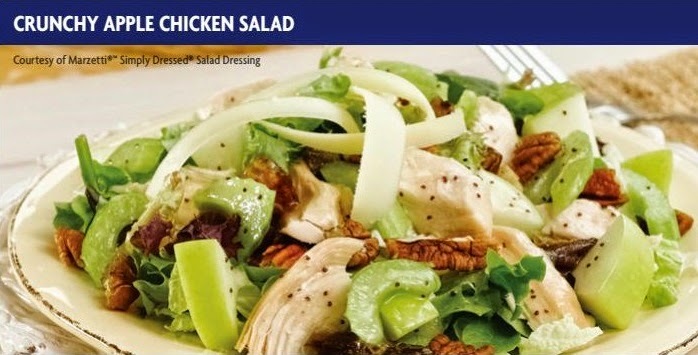 In a large bowl, combine Simply Dressed Balsamic Salad Dressing, chicken, apples, celery, dates, pecans and salt and pepper. Add cabbage and salad greens and gently toss. Place the bulgur wheat in a bowl and pour the boiling water over it. Cover with plastic wrap and allow to stand at room temperature for 1 hour. Preheat the oven to 350°F. Place almonds on a sheet pan and bake 5 to 7 minutes or until nuts are golden brown. Cool. Remove plastic wrap and fluff the bulgur wheat with a fork. 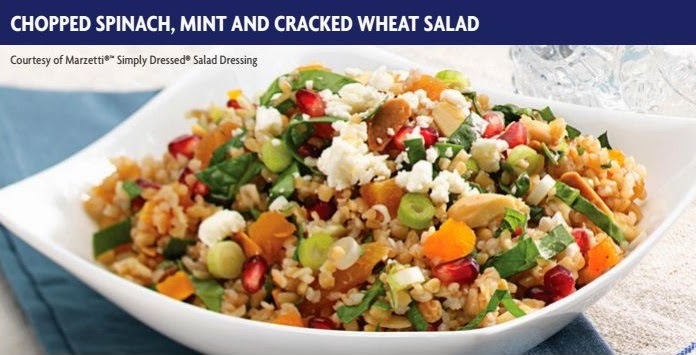 Pour 1/2 cup Simply Dressed Pomegranate Dressing over bulgur wheat and mix. Season with salt and pepper to taste. Add almonds and all remaining ingredients to the bulgur wheat. Drizzle the remaining 1/4 cup of dressing over all and gently toss. Serve. Disclosure: All opinions are my own. I received Simply Dressed vouchers at no cost for the purpose of this review. No other compensation was received.